FSH or follicle stimulating hormone is a hormone that signals the ovarian follicles in your ovaries to stimulate the growth of immature eggs or ova. 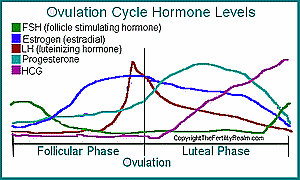 This hormone rise signals the start of a new ovulation cycle. Follicle stimulating hormone levels start to rise near the end of your last ovulation cycle just before your menstrual period begins. At this time, progesterone levels drop as a result of the corpus luteum degenerating because fertilization or implantation of the egg (ovum) did not take take place during your last ovulation cycle. Because of this drop, your uterus begins to shed the endometrium (lining) and you get your period. FSH hormone levels will continue to rise throughout your menstruation period. This hormone is a gonadotropin hormone that is made and released from your pituitary gland. Follicle stimulating hormone, as it relates to your menstrual cycle, is controlled by pulses of gonadotropin-releasing hormone (GnRH) from your hypothalamus. As your eggs (ova) mature, they release estrogen, or more correctly, estradial (one type of estrogen). As estradial builds and begins to peak, this signals the hypothalamus to slow production of gonadotropin-releasing hormone (GnRH). This then signals the pituitary gland to slow production of the follicle hormone. Before this drop in follicle-stimulating hormone, your eggs (ova) have been competing to be the dominant one. This drop ensures that (usually) only one follicle, that contains one egg (ovum), will reach dominance and be released at ovulation. Of course, if two reach dominance, you get (fraternal) twins. And so on. What this action does is ensure the best, strongest, and healthiest egg (ovum) of the bunch, is the one to be 'ovulated'. As estrogen levels peak and FSH levels drop, this signals LH (luteinizing hormone) to surge. 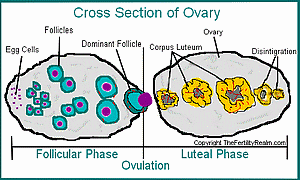 Which then tells the dominant follicle in the ovary to burst and release the mature egg. This signifies the end of the follicular phase of your menstrual cycle and the luteal phase begins while still under the influence of luteinizing hormone.